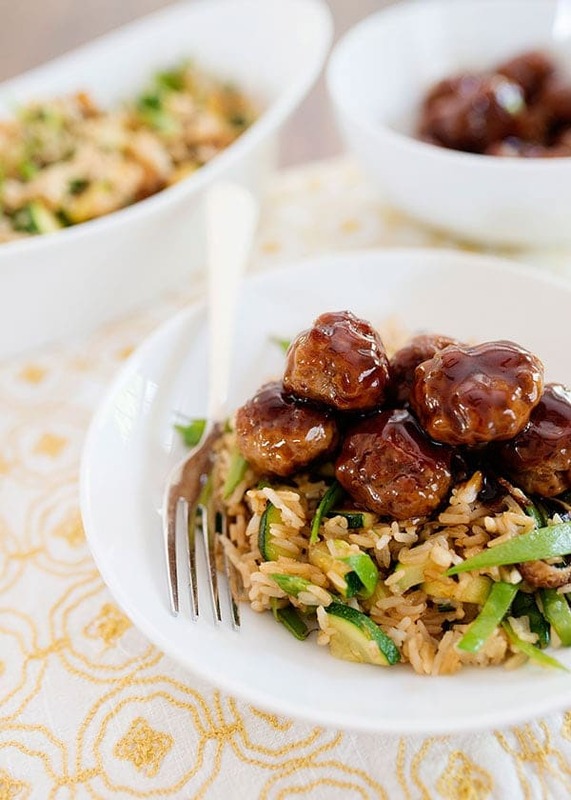 Soy Ginger Pork Meatballs with Zucchini and Snow Pea Fried Rice made using a Blue Apron kit. My review of the Blue Apron delivery service. After my Blue Apron post a few months ago, I continued to use the service and I still really love it. (On my own dime, it was not sponsored in any way.) The last few months have been crazy around here. Lacrosse, swimming, moving, and the craziness of the end of the school year. Having the Blue Apron Family Plan delivered on Wednesdays has been so helpful. No matter how nutty the day was, dinner was prepped and ready to go, all I had to do was cook it. No random trips to the grocery store because I forgot something. Between this and grocery delivery, life is so much easier. The meals have been really delicious. Simple, wholesome, and flavorful. Made with high-quality ingredients and farm fresh produce. We ate a lot of things that we wouldn’t have normally have and they have inspired me to add some new flavors to the things that I already cook. (I did buy a jar of miso, and I made an incredible sauce with it.) You can check out some of the other things we have eaten here. This week we had Seared Chicken with Crispy Smashed Potatoes with Braised Green Beans and Soy Ginger Pork Meatballs with Zucchini and Snow Pea Fried Rice. Truth – I wasn’t sure how I was going to feel about pork meatballs. I’m not normally a big ground pork fan, but I might take that back, these were delicious. They were crispy and sticky and I loved the soy glaze they were in. (I need to figure out how to make that on my own.) The fried rice was a perfect accompaniment. And less than 40 minutes from opening the box to the table. Want to see how easy this was to get on the table? 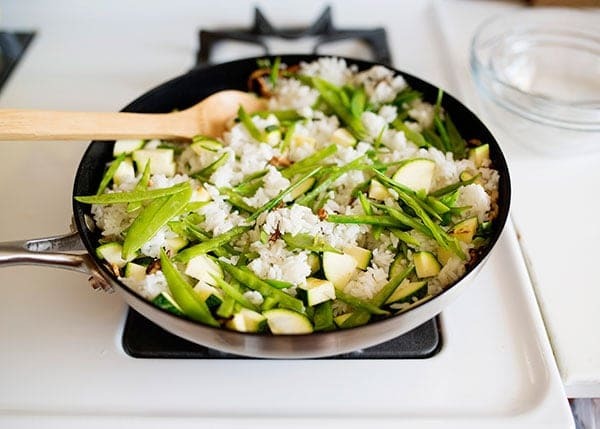 Start the rice, and while that is cooking, prep and chop the produce. 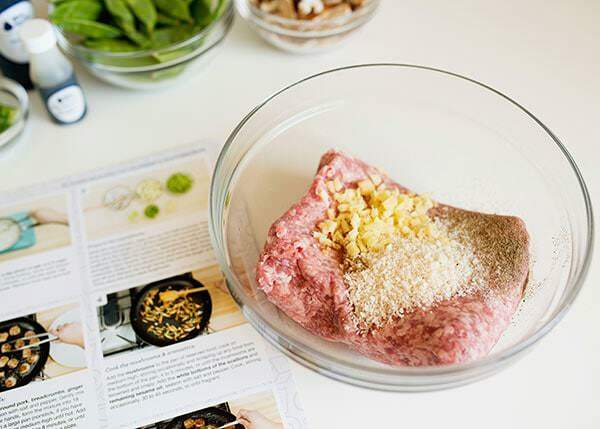 In a bowl (I have the 10 piece prep bowls and I use them for EVERYTHING) mix together the pork, breadcrumbs, ginger, and a little sesame oil. 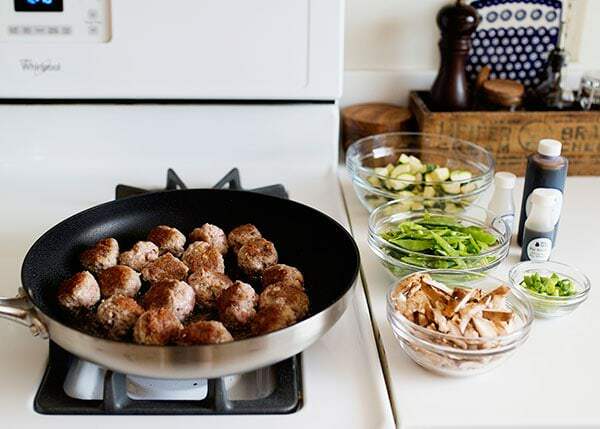 Roll into balls and cook the meatballs in a large nonstick pan. (Blue Apron sent me this one and it is a great pan. It is a perfect size, heats evenly, and is easy to clean. 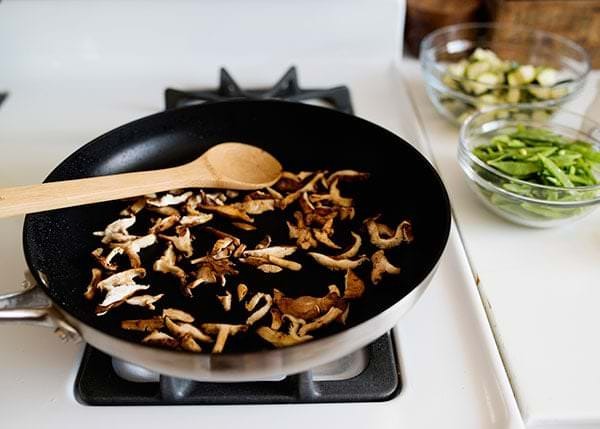 I was in the market for a new nonstick pan, and am really happy with this one that they sell in the Market. 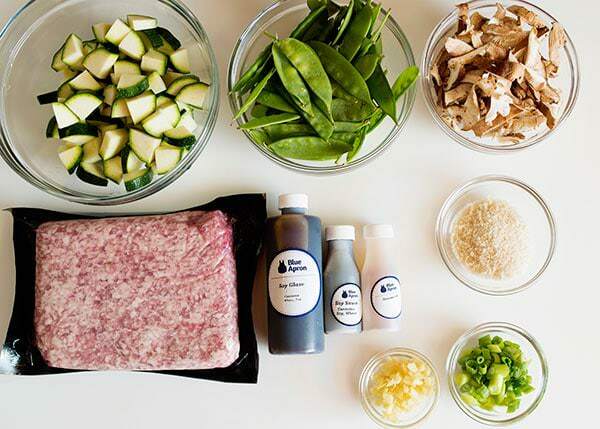 If you need to purchase cooking tools Blue Apron has a market where you can order tools (and wine!) you may need to cook the meals. 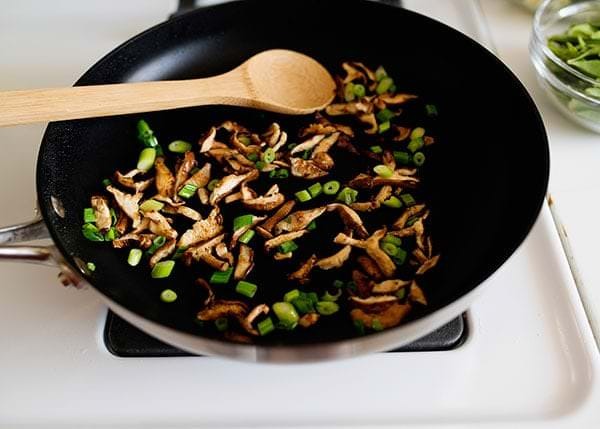 This is great for people that might be learning to cook and are just starting out. Or in my case – upgrading or replacing some items from my college kitchen. My old 12-inch nonstick pan was from my senior year of college. (Don’t judge.) It’s one-stop shopping. Take the meatballs out and add the shitake mushrooms. Cook until they are brown. Add the green onions and cook for a few more minutes. 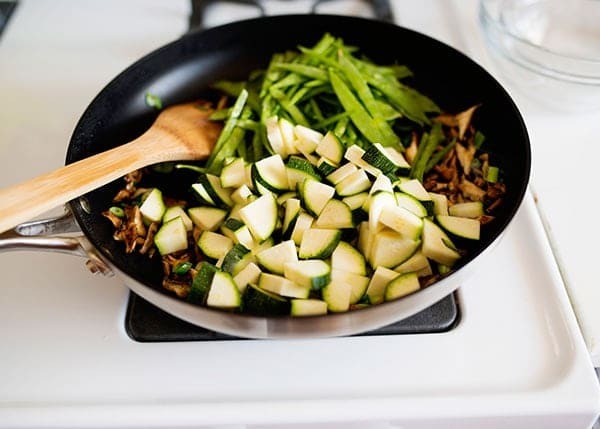 Add the zucchini and sliced snow peas. Cook until tender. Add the cooked rice and soy sauce. Transfer to a platter. 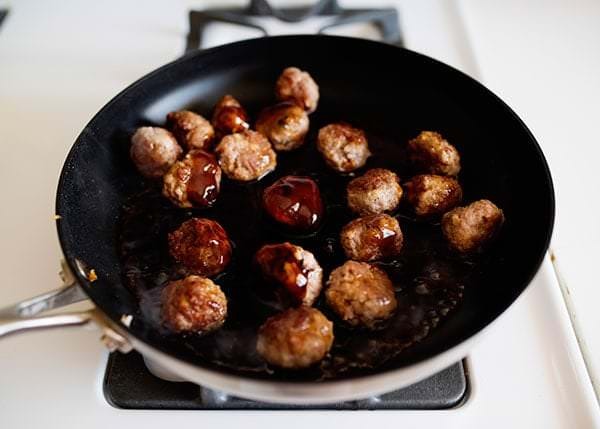 Add the meatballs back to the pan and add the soy glaze. Cook for another minute or two until the glaze has reduced and serve with the finished rice. Am I still a happy Blue Apron customer? You bet. 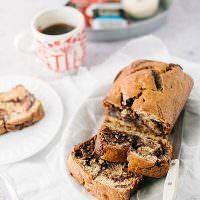 The recipes are healthy (between 500-800 calories), delicious, and use ingredients that are creative and include things that I wouldn’t have tried on my own. I also love the variety. If there is a week that you don’t want, you can simply skip it. There is no commitment, skip or cancel at any time. 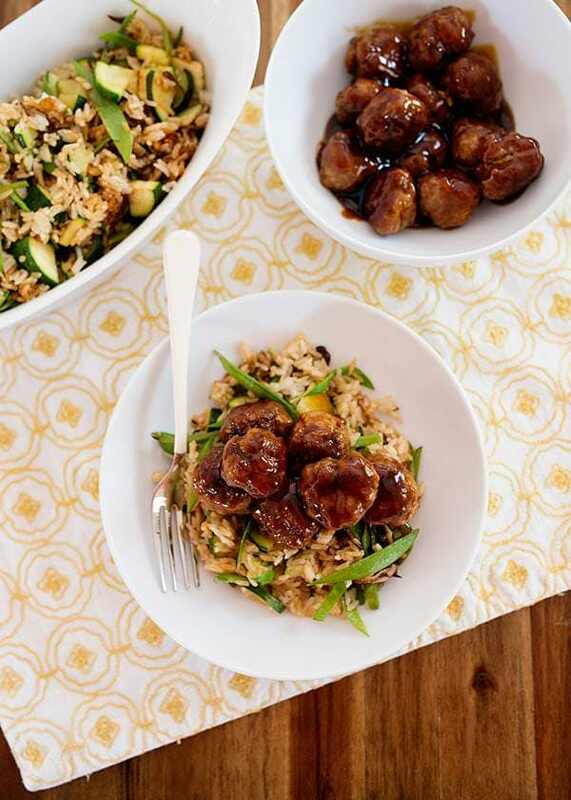 Want to give Blue Apron a spin? 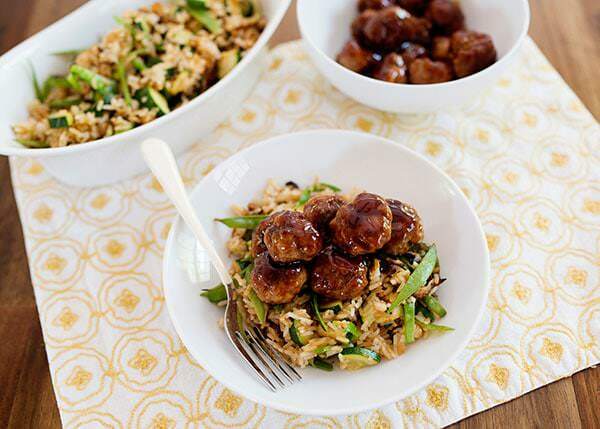 The first 20 readers will get 3 free meals from Blue Apron! 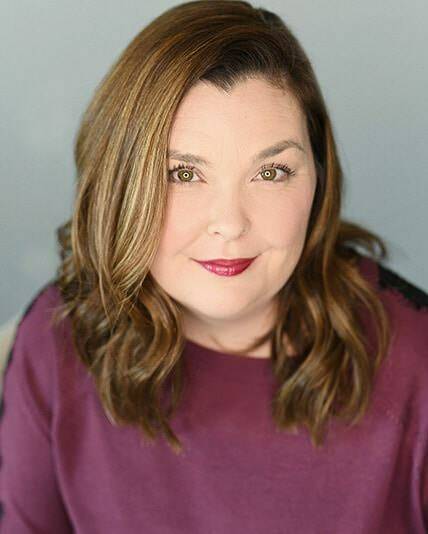 Click here to schedule your first delivery! This sponsored post is brought to you by Blue Apron. All opinions are 100% my own.